Now introduce a low noise amplifier is a project. The project build for operate in Earth-Moon-Earth mode. It's use MMIC for amplifier the weak signal. MAX2611 is my selection. 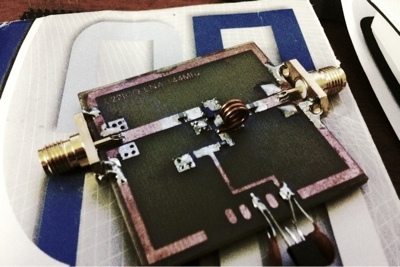 This IC has gain ~18dB at 144 MHz. In circuit is a simple design follow as data-sheet. Using an capacitor to filter Input and Output signal as I need to amplify. Until I measure, I think to do the redesign a circuit again. When I finish hope a improve a received weak signal from the moon.